If you are tired of spending money on heat sinks, or want to make anything out of melted aluminum, this tutorial is for you. Aluminum has a melting point of 1,221 F and is readily available from pop cans. 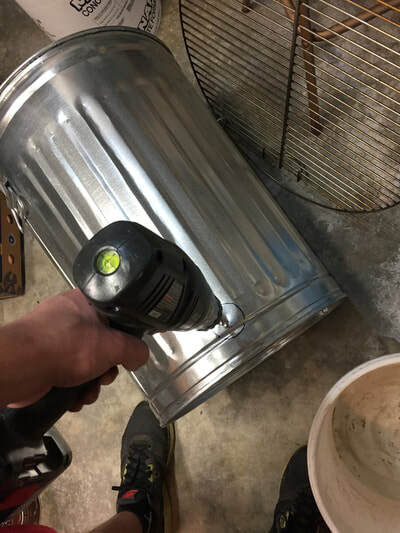 To create something useful you must melt the cans down, skim off the slag, and pour into a mode for the desired shape. I will guide you through this project I did over my 2017 Christmas break. To achieve a temperature of 1,221 F a furnace is needed. The furnace I made uses charcoal to heat, the air intake flow rate controls the temperature. This can be made fairly inexpensively from parts at a local hardware store. 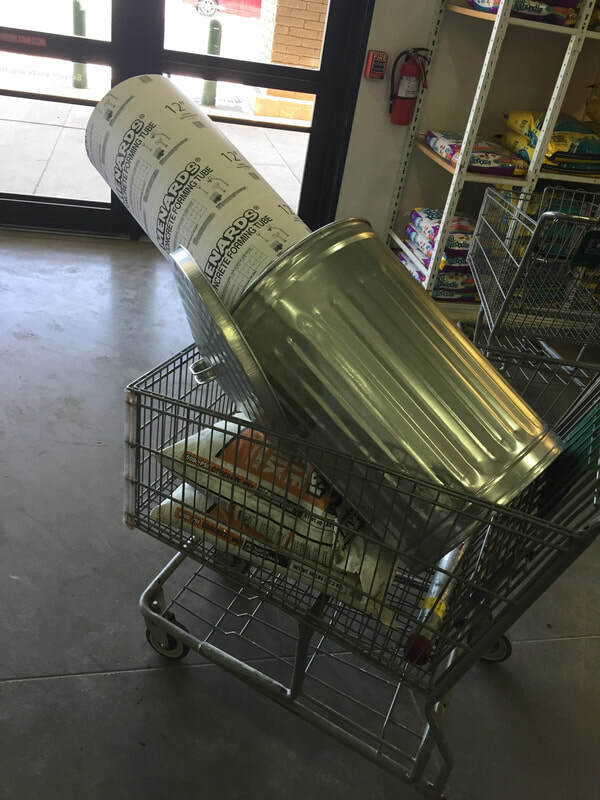 I purchased a steel garbage can, 2 bags of cement, a grill grating, a steel pipe, and a 12" cement tube. Going to a local thrift store you can find many useful steel bowls to use for holding the molten aluminum (Steel won't melt at 1,221 F). 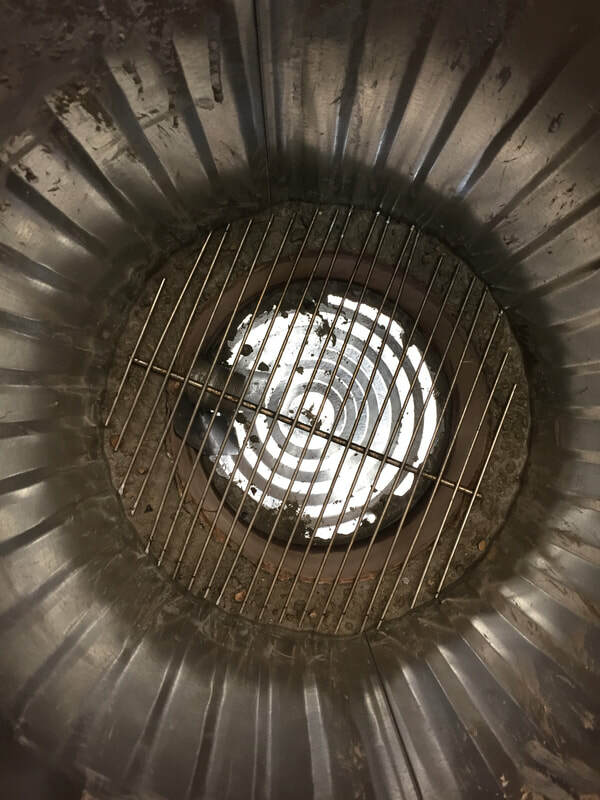 The design of the furnace is to create a hollow cylinder of cement inside the garbage can for insolation. 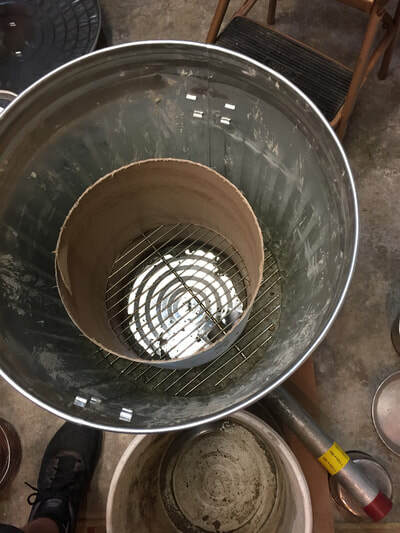 The steel grading will be placed off the bottom of the can to support the steel crucible and allow for ash to fall into the bottom tray. The steel pipe is used for a air intake located at the bottom of the furnace to blow air through the burning charcoal. 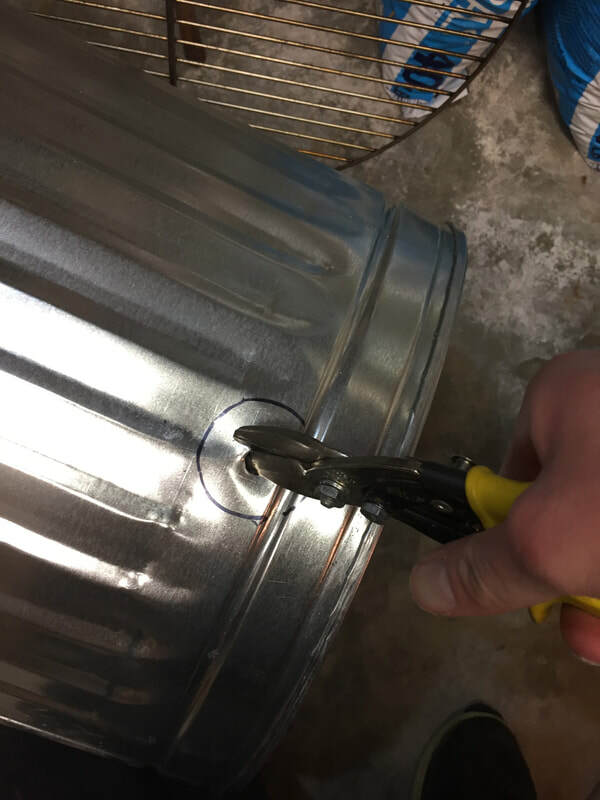 Start by cutting a whole near the bottom of the garbage can for the steel air intake pipe to slide into. Do this by outlining a circle of pipe radius and drilling a hole in the center. Use tin snips to cut the whole further to the correct dimensions. After this the edges can be smoothed using a file. Insert the pipe to make sure it fits snugly. 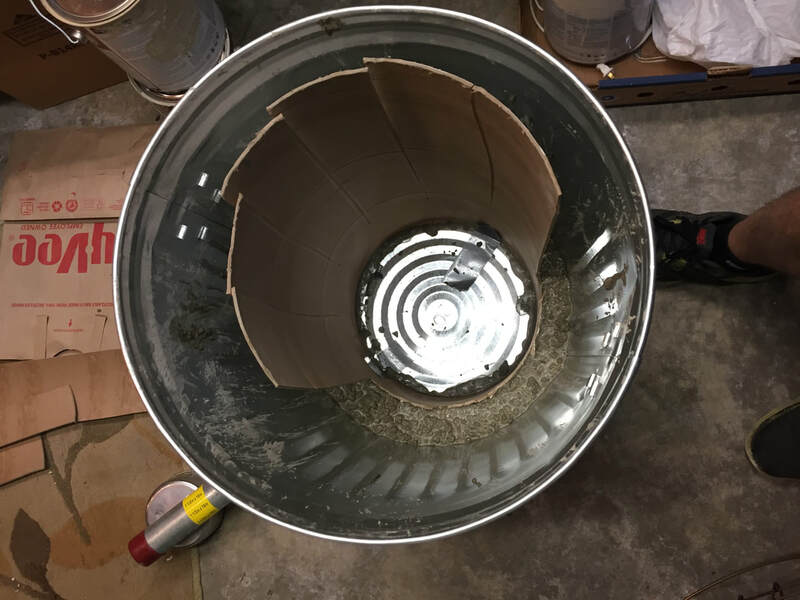 Lastly center the 12" cardboard concrete form inside the can to prepare for poring concrete. I would suggest cutting a 1 foot piece of it to place in instead of the entire thing. 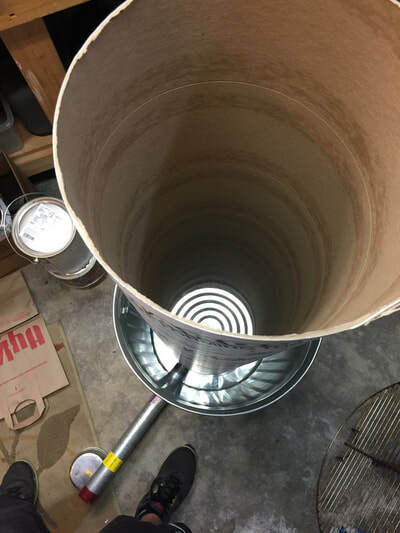 Cut a hole in the cardboard to slide the pipe into the center empty chamber. Now it is time to poor concrete. I found that using a gardening trowel and 5 gal pale was handy during this part. My technique during this was to do small batches at a time to make mixing easier. 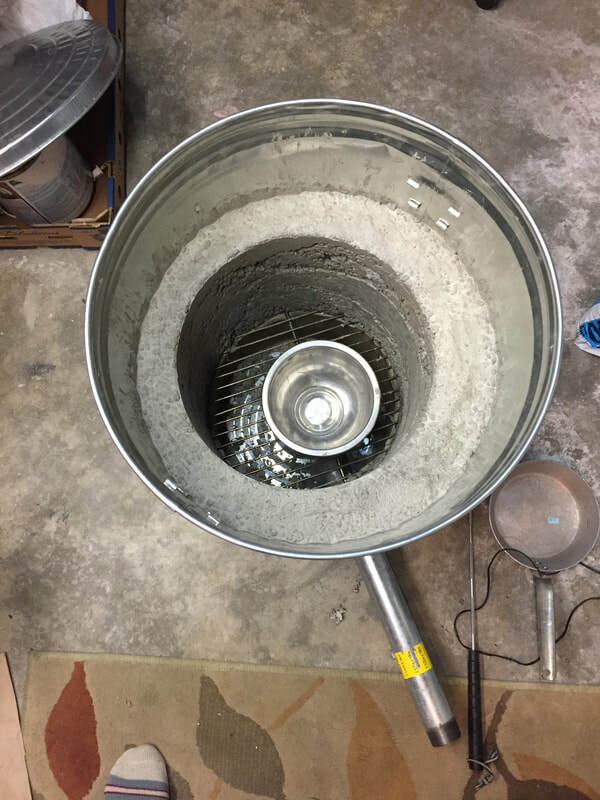 Place a amount of concrete you would like to work with in the 5 gal pale and add a bit of water. Mix thoroughly until it becomes a homogeneous mixture. Gradually add water until you reach the desired consistency, I found that it compacts better in the mold when it is more on the wet side. When mixing your forearm will get tired, I found rolling the 5 gal bucket on its side eases the process. 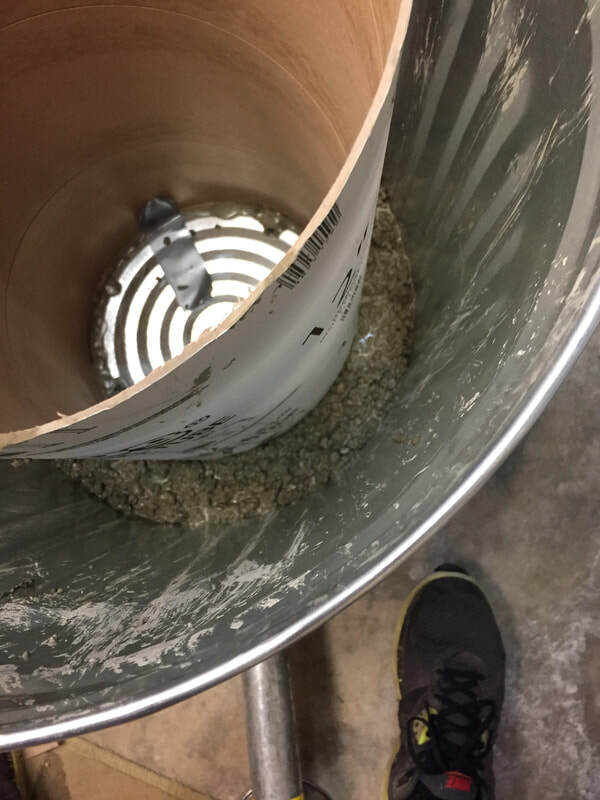 Shovel the concrete using the trowel in-between the garbage can and cardboard mold. 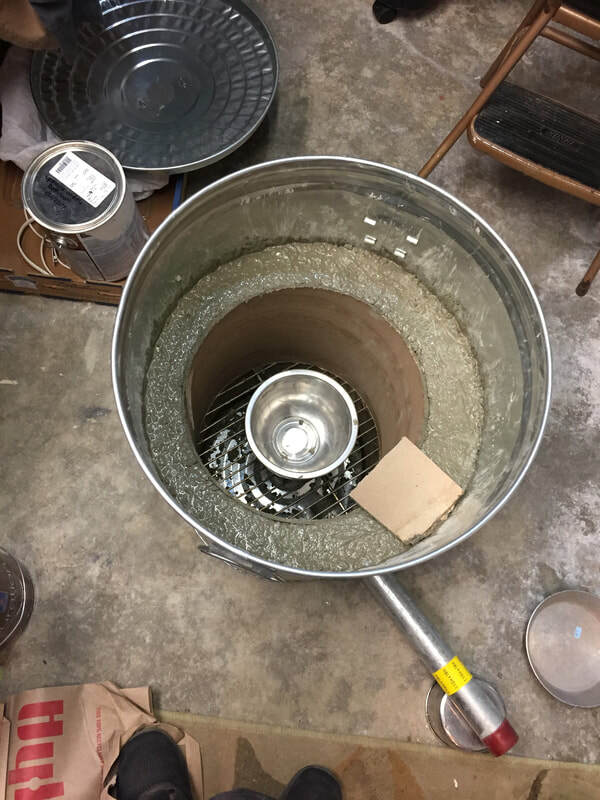 Hold onto the mold so that it stays centered until you have a ring of concrete around it to keep it stationary. Build this layer up past the air intake pipe. For me this was about 6 inches. Use a metal rod to pack in the concrete and relieve voids. Lastly make sure it is level and cut down the cardboard until it is flush with the ​concrete. After this layer you need to place the grill grating over top. Unfortunately, mine was too large to fit. I simply outlined the radius for it to fit and cut using a grinder. This fit right on top of the set concrete and was supported by the cardboard layer. 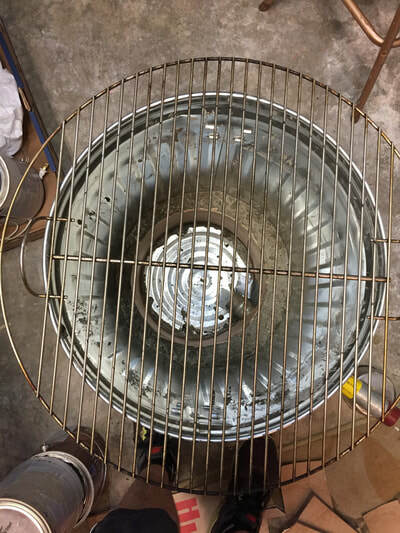 Now place the remaining cardboard tube on top aligned with the one under the gill grating. I then filled the remainder of the can with cement up toll the hand holds. Be conscious of how much cement you are adding as it will get heavy. I did this in the basement because it was 0 degrees outside and now have to carry the 75lbs furnace upstairs to use. In total I used about 1.5 bags of concrete. Once you reach the desired height use a piece of cardboard to smooth out the top surface. Leave to dry for a few days. Now that the concrete is hard you can remove the inner piece of cardboard to see you concrete work or just burn it out when you begin.